Often, chainsaw gloves are so bulky that they make related tasks like stacking logs difficult, meaning you have to either have another pair of gloves handy or risk performing these tasks without any protection at all. The Cutter Leather Classic Chainsaw Waterproof CW400 Gloves are made from durable cow grain leather, making them highly flexible. This allows you to stack logs without having to even remove the gloves beforehand. 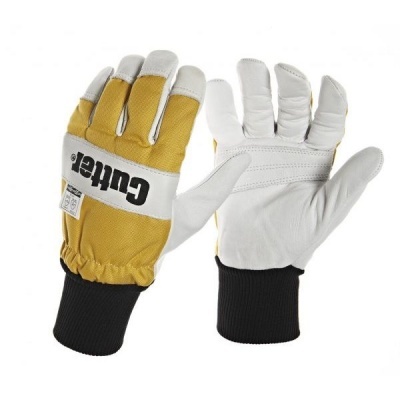 These gloves are resistant against cuts at 16 metres per second and have obtained Class 0 for this standard. This means they help to protect you against chainsaw injuries. As these gloves are designated Category II gloves, they should be suitable for most medium-weight tasks. The gloves have been designed for chainsaw work and are waterproof for wet conditions. The Leather Classic Chainsaw Gloves are available in four sizes to fit most hands. Please measure the circumference of your hand around the knuckles (excluding your thumb) with your palm open and your fingers together. Next, measure the length of your hand from the tip of your middle finger to your wrist.